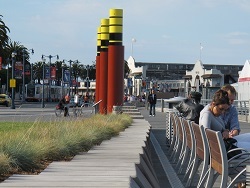 The Port of San Francisco is home to numerous works of arts along the waterfront. Located on Pier 70 is the very special Noonan Building, built in 1941. For decades the Noonan Building, the little gem of the Pier 70 complex, has been the beloved second home of many San Francisco artists, including Frank Lobdell, one of the pioneers of Bay Area abstract expressionism. In this unique wooden building, tucked behind the still vibrant shipyard, artists, designers and fabricators make their work by hand. In the tradition of makers, whether the end product be ships, rope, paintings, photographs, film, print, sculpture, digital media, or beyond, the Noonan artists carry on the necessary calling to produce meaningful work. For more information on the Noonan Building check out their website: www.noonanbuildingartists.com. The art installations located along the waterfront comprise one of two different categories: temporary art and permanent installations. Below is a list of art located on Port property, including their respective locations. This list is constantly changing and will update as temporary art pieces are exchanged. Description: The sculpture is represented in two parts connecting the Port of San Francisco and the Port of Haifa, Israel. The lighthouse-inspired sculture in San Francisco is linked to a similar sculpture in Haifa and provides a visual look at both ports through a periscope-like viewing screen. This art piece was commissioned by the San Francisco-Haifa Sister City Committee. The live feed from Haifa is viewable 24/7, and the city is 10 hours ahead of San Francisco. Description: Gracing the entrance to PIER 39, the much-photographed Crab with its living body and extended claws has become a familiar piece at Fisherman's Wharf. Name: "Guardians of the Gate"
Description: A bronze sculpture that depicts sea lions in loving embrace. Description: PIER 39 is home to “Open Heart," part of San Francisco General Hospital Foundation’s 2014 “Hearts in San Francisco” collection that supports the vital programs and initiatives of San Francisco General Hospital and Trauma Center. “Open Heart” was hand-painted by local artist Patrick Dintino, a San Francisco native whose mother’s life was saved more than a decade ago by open heart surgery. Name: "James R. Herman Memorial"
Description: To commemorate Port Commissioner James R. Herman and describe his contributions to labor and the San Francisco waterfront, the International Longshore and Warehouse Union (ILWU), Local 34 Waterfront Division, along with several other ILWU chapters and members, commissioned Tribute for the new James R. Herman Cruise Terminal at Pier 27. This Committee solicited Autodesk, an engineering, design and entertainment software company, to facilitate an artist’s selection process for this Tribute. Floating Point Collective was selected through this process to create this Tribute. The Tribute they created is an interactive audio and visual installation that is integrated with the interior of the cruise terminal. Description: This piece is a red, triangular steel sculpture, 70 feet in height and 10 tons in weight. It includes a circular top that moves in the wind; an elegant, kinetic sculpture. It serves as a gateway to the south beach waterfront. Description: Autodesk, the Bay Conservation and Development Commission (BCDC) and the Port, agreed to a public access area for the Piers 9-15 wharf area. Using Autodesk software, Surface Design created the barnacle benches using 'barnacles' as a theme conceived to reflect the natural history of the site and the tendency for people to cluster together, like barnacles. Description: A 197-foot mural installation that weaves together iconic imagery reflecting the Bayview neighborhood’s changing economy, ecology, community and history. It forms a 'gateway' into Bayview Hunters Point and is highly visible, changing from day to night as dynamic, projected lighting is cast upon it. Description: “This 2.5-mile long, 5-foot wide linear sculpture consists of concrete, glass blocks, and fiber optic lighting integrated into the design of the bayside pedestrian promenade. 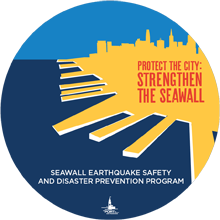 The work is a symbol of the juncture between the city and bay, commemorating the historic seawall and the water beneath the sidewalk." Learn more. Name: "Historic and Interpretive Signage Project"
Description: This piece, commissioned by GAP founders Donald and Doris F. Fisher, is constructed of fiberglass and steel. The piece resembles Cupid's bow and arrow, with the arrow drawn and the bow partially submerged in the ground. The piece was originally inspired by San Francisco's reputation as the home port of Eros, the Greek god of love. Description: The tidal cycle consists of two high tides and two low tides each day. Extreme tides can swing by more than 8 feet from high to low. The tidal columns show this cycle by floating up and down with the rise and fall of the tide. Count the stripes to read the height of the tide in feet. Learn more. 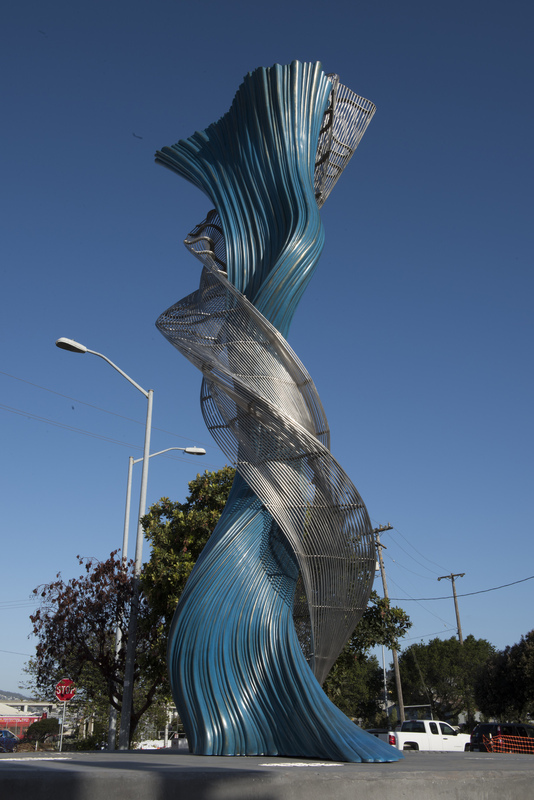 Description: The vibrant blue bronze and stainless-steel sculpture stands 20-feet tall and references the shape of the estuary with its different outlets before Islais Creek became a single channel. The stainless-steel wrap of the Islais sculpture was created by using the shape of the original coastline that explorers found as the profile for the rods at the bottom of the form, and the most recent shape of the mouth of the Creek as the profile of the rods at the top. Learn more.